It's never too late to learn to play an instrument, as many adults are proving every day. If you doubt it, just check out our waiting room. In it you will find adults with big smiles waiting eagerly with their guitars or vocal music for their favorite hour of the week, their music lesson. As many of them will tell you, it's something they have always dreamed of doing but didn't believe they could. And now that they have taken the plunge and they feel great about it. There are many reasons why an adult would study at the Mike Risko Music School. For some, it is a welcome relief from their grueling work schedules. For others, it is the realization of a dream they have had since childhood. As one of Mike's students once said, "I have been sending my kids to the Mike Risko Music School for years and I have seen such great results that I thought it was time I gave it a try." Then there was the bass student who said her bass had been sitting in her closet since she was 21. At 34 she became determined to play it. 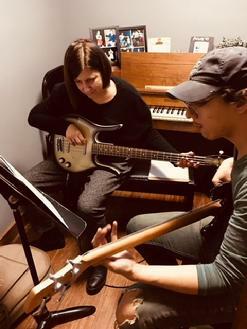 Another couple decided that music lessons were a great way for them to share something with their son, so instead of sitting in the waiting room while he took his guitar lesson, mom signed up for guitar too and Dad signed up for drum lessons. Then, there are the moms who want to play guitar for their kids or the dads who want to play with their kids. Whether they are looking to play nursery rhymes, showcase their original music in a band, or finally get that record deal they have been thinking about since college, we know how to train them. Some adults use music lessons as a way to get them through rough spots in their lives while others simply want to learn a new skill. At the Mike Risko Music School, the environment is so friendly and non-intimidating that the adults don't have to feel uncomfortable about taking lessons or feel that they even need a reason. Chances are you will be sitting in the waiting room talking to your neighbor, who is about to go into a lesson too. And as for practicing, well, we know adults are busy, but you'll find that fitting a little bit of practice into even the busiest schedule is not only possible, but can make every day so much more rewarding. When you register, we can help you create a practice schedule that works for you and your lifestyle. Plan on having fun and learning some music, set realistic goals for yourself and you will get the most out your lessons. So if studying an instrument is something you've always wanted to do, contact us today and we'll tell you how to get started. If you would like to find out how to register for lessons, go to register. You can also fill out the form below and someone will contact you right away! The Rock Band Summer Workshop for Adults August 2007 group.